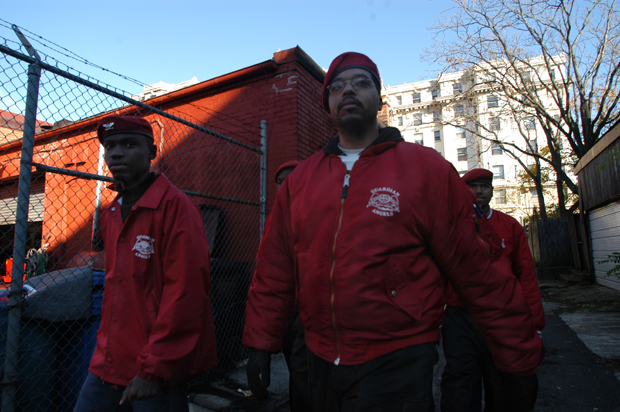 The Guardian Angels, a group of public saftey activists, patrol around Mt Pleasant. "As a rule we don't go into an area that we're not invited to," said Mark "Bishop" Saunders, the Guardian's D.C. chapter leader (foreground). A recent invitation from the District's city council also encouraged some visitors from the New York City chapter. "If it's a verbal dispute, we break it up. If it is more serious than that we may physically detain an attacker until the police arrive," said visiting NYC chapter leader Matthew McCoy (left). Saunders added that the group's relationship with local law enforcement authorities is outstanding.